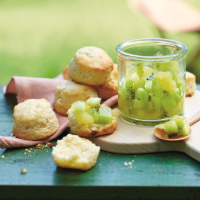 The zingy kiwi topping contrasts beautifully with these sweet scones - spread a little butter on them too for an extra treat! Preheat the oven to 220°C, gas mark 7. Grease a baking sheet. Grate half the chocolate and finely chop the remainder. Put the flour in a food processor with the baking powder, add the butter and blend until the mixture resembles fine breadcrumbs. Add all the chocolate and milk to the flour and butter mixture. Bring together with a rounded knife until soft and sticky, adding a dash more milk if necessary. Turn out onto a lightly floured surface and roll out to 3cm thickness. Cut out rounds using a 5cm cutter and transfer them to the baking sheet. Re-roll the trimmings to make more. Brush the tops with milk to glaze and bake for 12 minutes until risen and pale golden. Transfer to a wire rack to cool. For the topping, put the apple, lemon juice and sugar in a small saucepan and cook gently for 5–8 minutes until softened. Tip into a bowl and stir in the kiwi fruit. Leave to cool, then serve on top of the split scones, buttering them first if you like.